Posted July 31, 2009 by Emmet Farrell in News. There are now four traffic lanes in the centre of Claregalway – two inward lanes, one outward and one for access to shops. In a rural village! There are three lanes of traffic on each of the three approaches to the junction (9 lanes of traffic in a village) resulting in a significantly increased concentration of traffic in such a confined space. Difficulties in accessing and exiting from the Church and Funeral Home car parks and Lakeview Estate have increased with the new shopping lane. The poorly marked yellow box is ignored for the most part. Hard as it might be to believe without seeing the situation, the yellow box at the end of Mointeach Road is regularly ignored by outward traffic from Galway. It is incredible that the authorities have installed a system designed to get traffic through a residential area (of approx. 1550 houses) as quickly as possible while neglecting to address Health, Safety and Amenity issues for the residents. No improvements in the traffic light system can change the fact that the road is used as a major highway with traffic travelling at speed. The bus lane for outward traffic has no bus stop from start to finish. Presumably the bus lane from Kiniska to the village won’t have a bus stop either. Clearly these lanes are for passengers from outside Claregalway and not intended for use by local residents, unless they are happy to walk to/from the centre of the village. 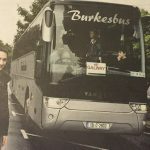 Recent reports indicate that commercial buses are to be increased to every 15 minutes during rush hour to and from Tuam. How significantly will that increase be in reducing traffic. Now, a bus lane through the centre of the village is reportedly on its way, adding further to traffic density. Minister Dempsey would like to see more people walking and cycling! The existing bus lane is marked as suitable for bicycles!! Deputy Jackie Healy-Rae announced this week that “During these hard economic times, I was able to secure €10 million for this bypass (Castleisland) from Noel Dempsey, the Minister for Transport. 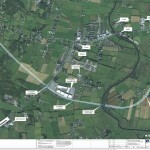 The Castleisland bypass is the only new road to get funding in 2009”. What about the promises from Minister Noel Dempsey to Deputy Noel Grealish that we heard about so many times? Deputy Frank Fahy is a member of Government and Chairman of an Oireachtas Transport Committee but has done nothing to help us. 600 more houses in Claregalway are included in the Amendments to the Draft Galway County Development Plan 2009-2015. A relief-road for Claregalway is included in a list of 13 towns/villages throughout Co.Galway, “all subject to funding” and is not prioritised or timing given for starting work. 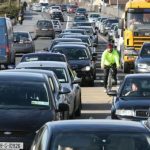 In the Plan no priority is evident in favour of Claregalway where traffic congestion is recognised from north to south, and east to west as presenting a notorious bottleneck, inappropriate for the volume of traffic – 40,000 movements daily. 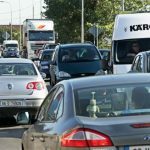 Funding for planning a relief road and for an Environmental Impact Study by the Government were announced a number of times. Has any funding been received? Will the EIS study be completed this summer? Residents are not kept up to date on what work, if any, is in progress on the relief road. It must be concluded the current Government has no intention of honouring its commitment to bypass Claregalway. It can be done in Kerry, but not in Galway. Voters should remember this when voting in upcoming elections.